Archivematica's primary preservation strategy is to normalize files to preservation and access formats upon ingest. The preservation copies are added to the AIP and the access copies are used to generate a DIP for upload to the access system. Note that the original files are always kept, to allow for different preservation actions in the future, such as normalization to different archival formats or emulation. Not all digital objects can be normalized on ingest. For example, for some digital objects like CAD drawings or Microsoft Visio files there are no available Linux-based open-source tools to handle the conversions and/or no agreed upon preservation formats. In addition, some formats such as Microsoft Word documents are not necessarily in the best preservation format but are still so ubiquitous and well-supported that they need not be normalized at the present time. In these cases, the Archivematica default is to keep them in their original formats; format risk assessment and information received from our users over time will allow Artefactual to expand the defaults over time to include more formats via the Format Policy Registry or FPR. A format policy consists of the business rules and tool commands for format normalization. The FPR lists all of Archivematica's default format policy rules. 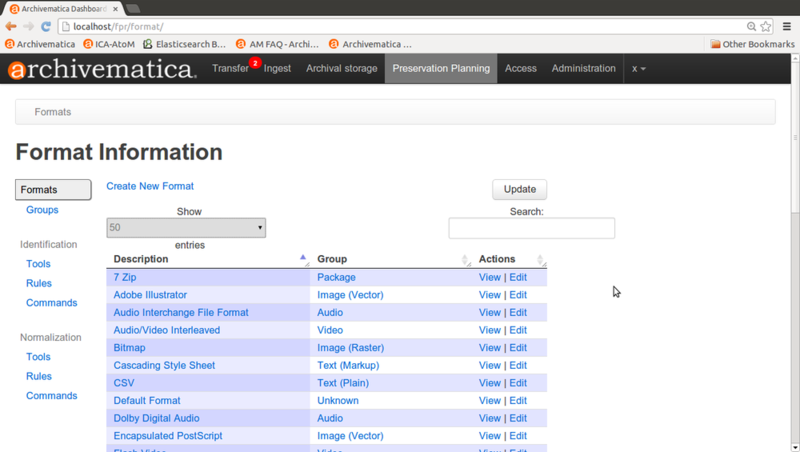 In your Archivematica instance you can download updates from the FPR by selecting Update in the Preservation Planning tab. To see the success rate of any given format policy, go to the Normalization rules table in the Preservation Planning tab. This page was last modified on 9 July 2014, at 16:00.